Edit: This started as a possible non-comm thread but Howell turned out not to be serving at the time. However, thought the info supplied, particularly by Dolphin, would be of interest here. I think this may be a non-comm. At least I can't find him on CWGC. He died 9 Dec 1919 near Corfu while attempting a flight from London to Australia (he was Australian). The other man who died in the accident, Air Mechanic 2nd Cl. George Henry FRASER, A.F.C., is commemorated. Originally served with 46th Btn, AIF, 5257, L/Cpl. DFC awarded to Capt. Cedric HOWELL, DSO, MC, 45 Sqdn, RAF. Alexandria February 15th for transhipment to Aust. Memorial stain-glass window dedicated at St. Anselm's Church of England, Middle Park. on Thursday, April 22, at 3 o'clock. W. G. APPS and SONS, Funeral Directors, Heidelberg. W. G. APPS and SONS is now a WHITE LADY FUNERALS, so I will call them tomorrow to see if they have the grave number/location. Heidelberg is only a 15 min drive from where I live. Would a death cert be required? The information given in his service record is pretty concrete. I checked but no listing in Vic Great War Index BD&M 1914-20 (wasn't expecting there to be an entry given he died overseas). Sounds like he was quite a pilot. His RAF service record shows that he retired from the RAF on 31.07.19. Therefore, he was a civilian when he died and hence his non-commemoration. The nature of his last flight also suggests a civilian enterprise. His passenger was still a member of the AFC and so is commemorated. I was speaking to Gareth (Dolphin) about this a few weeks back. He has written a lot about the London-Australia flights, including the sad deaths of Howell and Fraser and it makes fascinating reading. I'm sure he'll be along shortly to add some details to the thread. Thanks Terry and Stephen. Got a bit carried away there. Yes, it suddenly dawned on me that he was probably not still serving and hence not eligible. Not to worry - he's on the AWM Commemorative Roll, so that's something. I believe there was a post-war competition, with the first person to fly back to Australia winning a handsome prize (£10,000 ?). I seem to recall a similar accident with fatalities. Seems a great pity, to survive the perils of war only to die in an accident returning home. I will still visit Heidelberg cemetery tomorrow to see if I can locate the grave and check on its condition. Martinsyde Ltd entered G-EAMR, their rather prosaically named A Mk 1 biplane – basically an enlarged edition of the firm’s F.4 Buzzard - with a 275 hp Rolls Royce Falcon engine, and supposedly the fastest aeroplane in the contest. There were elaborate plans for the Martinsyde to be converted from a landplane to a floatplane at Calcutta, and to operate from water in the later stages of the flight . The A was designed for ease of construction and maintenance, as well as for pilot and passenger comfort; this machine was adapted to include an enlarged fuel tank to give an endurance of about ten hours, while carrying about 450 kg of spare parts, including a propeller. Capt Cedric ‘Spike’ Howell DSO MC DFC, from Melbourne, was nominated as pilot and Sgt George Fraser from Bendigo, Victoria, was the navigator and mechanic. After joining the AIF in January 1916, Howell had transferred to the RFC in March 1917 and then gone on to fly Sopwith Camels with No 45 Sqn RAF in Italy, where he was credited with 19 victories. Fraser who, at age 40, was the oldest participant in the Race, had joined the AFC in March 1917 and served with No 5 Training Squadron in England and at the RAF’s No 1 School of Navigation and Bomb Dropping. The Martinsyde Company was well prepared for the contest, and arranged for fuel supplies and spare parts to be located at aerodromes along the route, and floats were sent to India. Capt Howell left Hounslow on 4 December, in the inevitable bad weather that it seems was a normal part of these pioneering England-Australia flights. The plan to fly to Lyons on the first day was thwarted by a defective fuel pump, so Dijon became the first stop - where the tailskid snapped on landing. The next halt was Pisa, but strong headwinds forced a diversion to Toulon on the way. Pisa aerodrome was sodden and, to add to their difficulties, the airmen found that a spare tailskid wasn’t among the spare parts waiting for them. Presumably whoever arranged for the stores of spare parts calculated that the tailskid wouldn’t need replacing. Nevertheless, after some on the spot improvisation and carpentry, the Martinsyde left for Taranto next day, but the weather prevented the aeroplane getting any further than Salerno. On 9 December, the aircraft left Salerno for Athens, a journey that should have taken about four hours. However, nothing was seen of the machine until it appeared near Corfu some eight hours after take-off. The direct flight to Corfu would have taken only about 90 minutes, and the route of the Martinsyde after Salerno remains unknown; there may have been a landing somewhere to attend to a problem, or for some other reason. The airmen may have become lost over the Sea, and headed for Corfu as the nearest land after working out their position. In all probability we shall never know. The Martinsyde came down in the sea near St Georges Bay, and it seems that at least one of the crew survived the ditching, as cries were heard by people on the land. Unfortunately, conditions were too rough to permit a boat to be launched until the seas abated. The wreck was eventually found, but it broke up during salvage efforts . Capt Howell’s body was washed ashore, but Sgt Fraser’s body was never found. Some mystery still surrounds his death of the airmen. The Howell family claimed that he had managed to land the aircraft somewhere on Corfu and had then been murdered before the Martinsyde and the crew’s bodies were pushed into the water. It was noted that the pilot wasn’t wearing his Sidcot flying suit and boots, and that none of the money and credit notes that he was known to be carrying were found on his body. Further, there was sand in the airman’s pockets, which suggested that they hadn’t been properly searched when found, even though some personal items had been recovered. Howell’s father kept calling for a further enquiry, but to no avail. The mystery remains. In April 1920 Capt Howell was given a military funeral in Melbourne, where one of his pallbearers was Capt Harry Alexander Rigby MC, who had once intended to enter the contest. Thanks for that extra info, Gareth. All very interesting! The other casualties I recalled reading about were Lieut. Roger Douglas, MC, DCM, and Lieut. 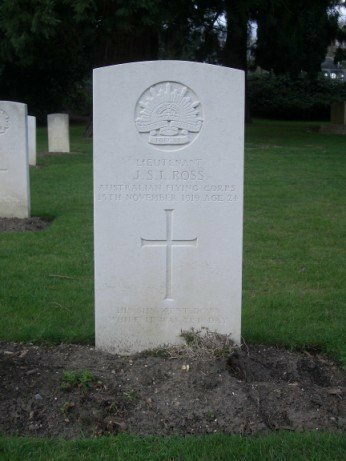 J. S. L. Ross who died when their Alliance aeroplane with 450 h.p. Napier Aero engine crashed at Surbiton 13 Nov 1919. So two out of the five entries crashed, with tragic consequences. The winner of the competition was, of course, Captain Ross Smith, along with brother Lieut. Keith Macpherson Smith, Sergeant W. H. Shiers and Sergeant J. M. Bennett. This thread perhaps could be moved elsewhere now that it's not a non-comm. Or another started elsewhere. Capt Roger Douglas, from Charters Towers in Queensland, was a former AFC pilot from No 6 Training Squadron, who had been awarded the DCM and MC while serving in the infantry on the Western Front. Lt James Ross from Moruya, NSW, had flown SE 5as with No 2 Sqn in France, and was a qualified navigator. Their aeroplane was the product of the new Alliance Aeroplane Company, which was keen to make a name for itself in the post-War world. The company’s P-2 Seabird had already established the record for a flight from London to Madrid , and a similar machine, G-EAOX, named Endeavour, was entered as a contestant in the flight to Australia. It was powered by a 450 hp Napier Lion engine and was fitted with many contemporary innovations and conveniences, including an enclosed cabin, a wireless , a revolving seat for the navigator, dual controls, fire extinguishers, compartments for food, beverages, spare clothing, etc. To modern eyes, the crew accommodation appears rather odd, as there was limited provision for forward vision by the pilot in the rear seat; he could only look to the front by means of a triangular opening in the fuselage near his head, from which he could see ‘fairly well’ according to Flight magazine. Endeavour arrived at Hounslow in late October, and was made ready for a departure on 31 October. The various seals required by the officials were affixed, but the weather prevented the airmen from leaving. Later in the day Capt Douglas took up the aeroplane for a brief test flight, which resulted in a heavy landing. Some apparently minor damage was repaired, and the crew waited impatiently for a break in the weather. The next two weeks passed slowly for the aviators, but on 12 November, after the departure of the Vimy, it was decided that the airmen would leave next morning, despite forecasts of fog and snow. Finally, at 11:33 on 13 November the Endeavour left Hounslow and climbed into the low cloud over the aerodrome. Only a few minutes later the aeroplane re-appeared, flying between 500 and 1000 feet/150 and 300 metres before entering a spin, then straightening out before another spin that ended in a crash in an orchard at Surbiton, some 6 miles/10 km from Hounslow. Both airmen were killed. The Coroner’s inquest determined that the Endeavour had turned back to Hounslow for an unknown reason and that the crash was probably due to Capt Douglas becoming disorientated due to reduced visibility – the enclosed cockpit may have been to blame. The inquest was interrupted by Capt Douglas’s fiancé, who claimed that the aeroplane hadn’t been properly repaired after the heavy landing two weeks before, but her protests came to nothing. Martin - just incase you didn't find him - this is a photo of the plaque - which really is in good condition - it's just when I cut the photo down to upload it didn't come out too good! I've also collected quite a lot of info on Howell because he fits into two of the databases I'm putting together - those Aussies that died in accidents during or after the war - and also those that married overseas. He married Cicely KILBY in 1917 in London - and the poor young lady came out to Australia (by ship) to make a new life with him - only to find herself a widow. 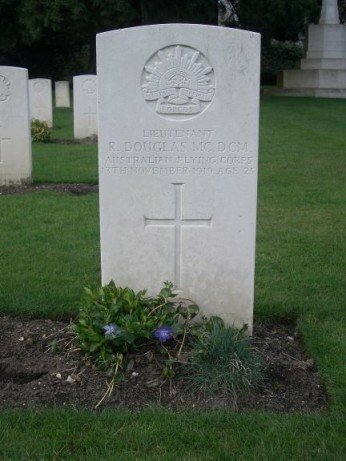 I wrote an article about the members of the AFC who died during, or as a result of, their war service. If you'd like the entries on those who died in accidents, both in the air and on the ground, send me a PM and I'll oblige. Thanks, Gareth. Great stuff. Obviously the families found it hard to accept, which is very understandable. I've asked an admin to move this thread. Thanks, Frev. I did find it, quite easily in fact (I contacted the council so have the location map if anyone is interested). At first glance, the plaque looked like a CWGC one but on closer examination it looks a little different. Looks more recent than the grave, perhaps the result of the efforts of some local historical society or similar. Yes, his wife was travelling to Australia on the Orsova at the time and, according to The Times, it was Captain Howell's plan to overtake the ship at Naples and salute his wife by circling over the ship and drop a message to her. He had apparently turned down a couple of offers of permanent commissions in the RAF to take up a position with the Martinsyde Co which was opening an office in Australia. I wonder if that venture eventuated given the accident. Just remembered about the Memorial window at St Silas in Albert Park..
One jump ahead of me again, Frev Yes, the window was originally in St. Anselm's church in Middle Park but, when the church was amalgamated in 2001 with St. Silas's, some of the windows were incorporated into the latter. Received confirmation from the parish secretary this afternoon that the Howell dedicated window was one that was moved to the new church, which is good. Thread relocated at Martin's behest. At first glance, the plaque looked like a CWGC one but on closer examination it looks a little different. Looks more recent than the grave, perhaps the result of the efforts of some local historical society or similar. 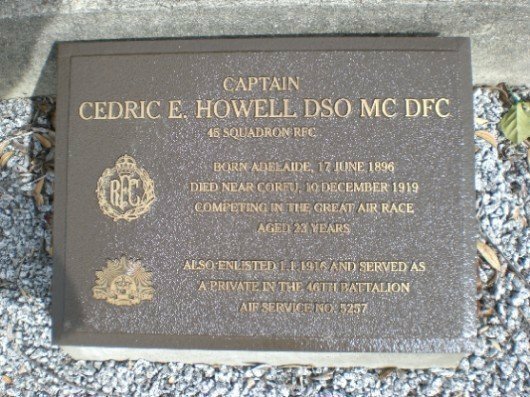 The Warringal cemetery coordinator didn't provide precise details but confirmed that a "war service" group from South Australia arranged Captain Cedric Howell's plaque just a couple of years ago (Howell was born in Adelaide). 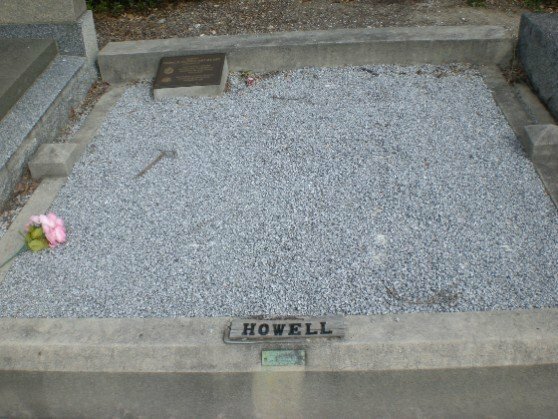 Cedric's mother, Ida Caroline Howell, is also buried in the grave. Date of burial 14.2.1938, age 68. The other casualties I recalled reading about were Lieut. Roger Douglas, MC, DCM, and Lieut. J. S. L. Ross who died when their Alliance aeroplane with 450 h.p. Napier Aero engine crashed at Surbiton 13 Nov 1919. Here are a couple of photos of the graves of Ross & Douglas in the Australian section at Brookwood Military Cemetery; oddly, although they were buried on the same day and probably had a joint funeral, they are not buried in adjacent plots, but are a little way apart. What is the correct birth year for Cedric Howell, 1892 (per RAF Air 76) or 1896 (the headstone and Australian records)? According to Howell's enlistment papers, he was 19 years and 6 months old when he joined the AIF on 1 January 1916. Unfortunately, they didn't record birth dates on the forms. In case anyone is interested, I'll progressively post my article on the flights. Unfortunately, posting the footnotes is something beyond my capabilities, so I'll leave them out. Prime Minister William Morris Hughes, who was in Europe for the Versailles Peace Conference, met Australian airmen in Britain and, on 18 February 1919 cabled the Australian Government to advise that many of the Australian airmen he had met were eager to see an aeroplane fly from the United Kingdom to Australia, while some were even eager to participate in such a flight. Hughes was also inspired by the successful flight to India. On 19 March the acting Prime Minister, Mr William Watt, announced that the Australian Government would present a prize of £10000 to the pilot of the first aeroplane to fly from England to Australia. The contest is often referred to as the England-Australia Race but, as the participants weren’t actually racing against each other it is probably more accurate to use the contemporary term ‘The England to Australia Flights’, which doesn’t have quite the same impact . There was some initial disquiet after the announcement of the prize, due to the many dangers posed to the competitors by flying over a route which had not been properly surveyed, at least beyond Calcutta. Hence, Brig-Gen Borton and the Australian members of the O/400’s crew continued on to Timor in the Netherlands East Indies (NEI) [now Indonesia] by ship (actually two ships, after the first caught fire at Chittagong ) to identify potential landing grounds. The survey party’s findings were released on 15 September: the only suitable landing grounds between Calcutta and Port Darwin were the racecourses at Rangoon and Singapore, plus an area at Bandoeng in the NEI. This meant that there was no suitable landing ground between Bandoeng in Java and Darwin – a distance of 1750 miles/2816 km. The NEI authorities were in the process of establishing landing grounds in Timor, reducing the final leg of the journey to some 600 miles/966 km. Thanks for posting those photos, Nigel. It is a little curious why the graves weren't placed together considering the circumstances. The Australian records are correct. He was born in 1896. I wonder if he increased his age on his RAF records accidentally on purpose. The flight must start from Hounslow in England (Calshot for seaplanes) and end at Port Darwin, after passing through a control station at Singapore. The media response to the announcement of the contest was varied and unsurprising; some sections were most enthusiastic, while others – with minds on other, more pressing, issues in the post-War world - considered the whole thing an enormous waste of time and money. The first airman to put his name down for the contest was former RNAS and RAF pilot Lt Bert Hinkler, from Bundaberg, Queensland, who entered before the conditions were announced. The Sopwith Company made available a Sopwith Dove single-seater – a derivative of the wartime Pup with an 80 hp Le Rhône engine. The Race organisers were reluctant to sanction a solo flight, but consideration of his entry went on for a while, before he eventually had to withdraw in August as Sopwiths needed his aeroplane to fill an order . On 26 May the Blackburn Company entered a Kangaroo, a converted anti-submarine bomber, to be flown by former RAF man Lt Valdemar Rendle of Brisbane, with Lts Charles Kingsford Smith, Cyril Maddocks and L Booker among the crew. However, for various reasons, the latter three airmen subsequently withdrew from the team. Eventually, the crew became Capt Hubert Wilkins MC – the famed Polar explorer and photographer – as navigator, and Lts Valdemar Rendle and David Williams from the RAF as pilots, plus Lt Garnsey Potts of the AFC as mechanic. Lt Ray Parer, ex-AFC, decided to enter in June, but he then had to find an aeroplane and a crew member. After securing funds from a sponsor, whisky magnate Peter Dawson, Parer and his partner, Lt John McIntosh, were able to purchase a DH 9. Capt Harry Alexander Rigby MC, who was credited with 6 victories over the Western Front while an SE 5a pilot with No 1 Sqn RAF, entered in July, intending to fly in a Nieuport biplane fitted with a 220 hp Zeitlin rotary engine; he subsequently withdrew in September. The Alliance Aeroplane Company entered one of their P-2 Seabird biplanes, named Endeavour, to be flown by former AFC men: Lts R M Douglas DCM MM and Lt J S L Ross. Two other AFC veterans, Lts Hudson Fysh and P J McGinness, who had returned to Australia, wanted to enter, but were unable to obtain a suitable aircraft. However, their association with the contest didn’t end, as they surveyed a route from Longreach in Queensland to Darwin – a project that took 51 days in a Ford Model T car - to be used by any competitors who wished to continue south after reaching Australian soil . On 15 August, Martin and Handasyde Ltd (better known as Martinsyde) entered an A Mk 1 biplane, to be crewed by former RAF officer Capt Cedric Howell DSO DFC MC and Sgt George Fraser of the AFC. After the earlier withdrawal of Bert Hinkler’s Sopwith Dove, on 16 September the Sopwith Company entered the Wallaby – a purpose designed aeroplane to be flown by former AFC men Capt George Matthews and Sgt T D Kay. On 18 October, Vickers entered a civilian version of their twin-engine Vimy bomber, to be crewed by Capt Ross Smith, his brother Lt Keith Smith, and Sgts Bennett and Shiers. Great stuff, Gareth! I didn't know about the sixth entry, Parer (have now found him in The Times). Apart from it being a difficult undertaking and, of course, very dangerous, it must have been a great way for those Australians to return home after the war. The lure of the £10,000 prize would also have been a big incentive, a fair amount of money in those days. Rather than describing events in potentially confusing chronological order, probably the easiest way to describe events is to follow the progress of each of the participating aircraft in the order of their departure. Perhaps to the slight surprise of the organisers, the first aeroplane to set off from Europe to Australia wasn’t an entry in the contest, and the crew wasn’t eligible for the prize. On 14 October, a week before the departure of the first official competitor, Frenchman Etienne Poulet, with his mechanic Jean Benoist, set off from Paris in a Caudron G.IV powered by two 80 hp Le Rhône rotary engines. Poulet was a pre-War aviator who had established several records before early combat flying with Escadrille C.4 and later service as a test pilot. Poulet’s theory was that the light weight of the Caudron would enable it to land where heavier aircraft couldn’t. His flight was intended as a tribute to his fellow pioneer aviator Jules Védrines, who died in an accident before he could put into action his plan to set off for distant Australia. Poulet had actually started on both 12 and 13 October, but had to return to Paris due to fog, before eventually getting away and flying to southern France on 14 October. Showing admirable confidence, he then requested the contest’s organising committee to arrange for supplies of fuel and other stores to be set aside for him at various points in Australia, as he intended to fly on to Adelaide after reaching Darwin. Although Poulet wasn’t an official competitor, the Australian government arranged for supplies to be made available. The Caudron battled through snow and strong winds as it flew over southern Europe and Turkey at a very slow speed – probably not more than 60 mph/97 km/h. The flight took the little aeroplane over the former battlefields of Mesopotamia and then what is now Iran and Pakistan before engine trouble forced Poulet to land near Pussni in India, where the crew faced hostile tribesmen. The men worked on the aeroplane during the day and night, while occasionally having to use firearms to deter the locals, who strongly objected to their presence. After a day and night, the Caudron was airworthy again, and the men took off for Karachi on 12 November. The now tired Le Rhône engines were replaced at Karachi, but departure was delayed due to the absence of suitable maps of the next stage of the journey. It was then that Benoist came down with malaria, which further delayed the men until 18 November. After Karachi the Caudron developed a series of minor defects which were worked on for six days at Nasirabad before flying on to Delhi and then Allahabad before heading for Calcutta. The next step was to Akyab in Burma on 28 November – the first aeroplane to ever land in that country. At first the inhabitants thought that the Frenchmen were emissaries from the Gods, but revised their thoughts next day, when the Vickers Vimy arrived with four more heavenly messengers. The two aircraft flew to Rangoon on 30 November, not being able to do so on the previous day as the city’s aerodrome was the racecourse, and the Saturday meeting could not be moved. After overcoming engine problems, the Frenchmen left Rangoon on 1 December, but found the mountains near the Siamese border too high for the Caudron to climb over. In addition, the prevailing poor visibility made flying extremely dangerous. Another attempt the next day was foiled by burst tyres during takeoff. Two days later, engine trouble forced the aeroplane to return to Rangoon after a short flight. Eventually, the Caudron made it to Moulmein in Burma on 8 December, and then set off for Bangkok next day. Alas, a broken propeller and a cracked piston dictated a return to Moulmein, where the intended flight to Australia ended. Well, not quite . . .
A replacement Caudron was obtained in France by Poulet’s supporters and sent to India so that he could continue, but the aeroplane’s poor performance in hot conditions made further progress most difficult. The Caudron did eventually make it to Java, and it could have been the second machine to arrive in Australia by air if Poulet had persisted, but he didn’t, and that was as close to Australia as the French airmen came. For some reason, the attempt was abandoned. Poulet went on to be prominent in the development of aviation in French Indo-China. Capt George Matthews and Sgt Thomas Kay were both former AFC men. Matthews was a pre-War sailor and qualified navigator. He was a Scottish-born Gallipoli veteran, who flew on the Western Front, first in SE 5as with No 68 (Australian) Sqn RFC before serving as a Flight Commander flying Camels with No 4 Sqn. Sgt Kay served as a mechanic with No 3 Sqn in France. At the time when the contest was announced, Matthews was working for the Sopwith Company and Kay was employed by Rolls-Royce. Their aeroplane, Sopwith Wallaby G-EAKS, was an adaptation of the Sopwith Atlantic design that was used in Harry Hawker’s unsuccessful May 1919 bid to fly across the Atlantic Ocean . Like the Atlantic, the Wallaby was powered by a 360 hp Rolls-Royce Eagle Mk VIII engine. The Wallaby featured a number of innovations designed to enhance crew comfort and efficiency, including retractable seats which permitted both crew members to shelter from the elements under moveable covers in the fuselage upper decking. There was provision for alternate control, as both airmen had a control column that could fit into a socket – when one was inserted, the other was withdrawn. A locker with a fold-down table accommodated maps. A series of lines was marked on the fuselage windows, which enabled the airmen to judge drift and progress. There were no less than three compasses. Flight magazine was impressed by one device: a ‘turn meter’ formed from tubes at each wingtip, connected to an indicator in the cockpit which registered the slightest deviation from a straight course. In order to show that they were on semi-official business while in the Race, both men wore their AIF uniforms. Like all competitors the airmen were amply supplied with essential provisions, including Bovril and Wrigley’s chewing gum. The Wallaby left Hounslow on 21 October, bound for Cologne in Germany, but fog forced a diversion to Marquise in France. After an extensive delay in Germany after a landing mishap, the aeroplane arrived in Vienna on 29 November, only to find that there was no fuel available. Fuel was eventually obtained, and the airmen continued their journey, only to be forced to land about 100 miles/160 km north of Belgrade where, Australian uniforms notwithstanding, they were promptly arrested as suspected Bolsheviks and thrown into prison. Their prison diet was an invariable unappealing serving of bread and pork fat, which made the men most determined to regain their freedom at the earliest opportunity. Fortunately, their captors weren’t very good at their job, and the crew was able to escape on 11 December. Luckily, the Wallaby was where it had been left and, even better, the engine started, enabling the pair to leave their captors behind, munching bread spread with Bovril as they flew – it was certainly better tasting than the pork fat of their prison diet. The Wallaby made it to Novisad, near Belgrade, where the crew had considerable difficulty in obtaining fuel from the occupying French garrison. Eventually, after about two weeks, enough petrol to allow a flight to Bucharest was supplied by a French aviator. The airfield at Bucharest was soft and wet, and take off was only possible by leaving early in the morning, before the snow had thawed. The journey to Turkey involved flying at 13000 feet/4000 metres for an extended period over Serbia and Bulgaria, and a forced landing in a snow-covered bog. When the Wallaby reached Constantinople (now Istanbul) with nearly empty fuel tanks on 23 December, the crew learned that the Smiths had reached Darwin in their Vimy, thereby winning the prize, but they nevertheless elected to continue. Departure from Constantinople was delayed by a leak in the Wallaby’s water jacket. After efforts to find a welder proved unsuccessful, the leak was repaired with chewing gum mixed with asbestos powder and bound with copper wire. Baghdad was reached on 21 January after flying around, rather than over, the intervening mountains – the engine was badly in need of service and not performing at its best. After engine maintenance in Baghdad the Wallaby flew to Bushire in Persia (now Bushehr in Iran) and the next major stop was planned to be Karachi, but a sandstorm forced a landing on a beach on 3 February, damaging the propeller, axle and a longeron. The aviators dragged the aeroplane into a sheltered cove, and Matthews set out without food or water under a burning sun to summon help from Bandar Abbas, a journey that took five gruelling hours. The British Consul came to the rescue, and chartered a boat to reach Sgt Kay. A storm drove the boat off course, and it took three days to reach the stranded airman. The damaged longeron was repaired with some angle iron from a fence, while an old iron bar was spliced into service on the axle. The airmen had a spare propeller, but it was warped by the sun and rain. Nevertheless it was fitted, and carried the Wallaby as far as Bali. After leaving Bandar Abbas, the Wallaby was forced to land at three miles away at Jask on 24 February, where the spliced axle failed and a wing was damaged. The aeroplane was dragged some three miles to the shelter of a house, where it was repaired, and then dragged a further three miles back to Bandar Abbas for further work before leaving on 3 March. Karachi was finally reached on 3 March, 134 days (but only 49 flying hours) since departing from Hounslow! Here the crew met fellow competitors Parer and McIntosh in their DH 9. The next stop was Delhi, and then on to Calcutta, where the airmen crossed paths with Italians competing in a Rome-Tokyo Air Race . From Calcutta, the Wallaby flew to Rangoon, where a wing was damaged during landing. After leaving Rangoon on 30 March, thunderstorms were the only problem on the flight to Bangkok, where Kay became ill with dengue fever. After Kay recovered, the men resumed the journey, only to be delayed for two days at Singora in Siam (now Thailand) by engine trouble. Then it was on to the control point at Singapore, which was reached on 8 April.